Product prices and availability are accurate as of 2019-04-24 20:22:12 UTC and are subject to change. Any price and availability information displayed on http://www.amazon.com/ at the time of purchase will apply to the purchase of this product. With technology taking leaps for the better, Marino Avenue Ratchet Linxx Belt is as effortless as anything. Just lift the buckle to obtain an inaudible and stunningly smooth release. That's another definition of Marino - Quality and fashion with utmost convenience and technology. 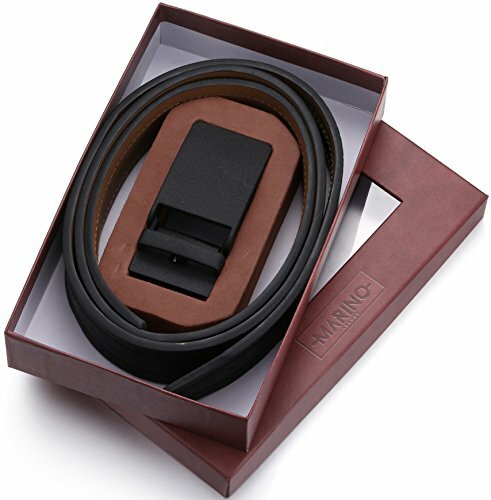 Marino belts are made with superior quality genuine leather concealed with fortifying polyurethane. The buckle is coated in the same genuine leather for utmost quality and matching look. Our state of the art features provides a convenient and effortless experience. The tip of the belt inserts into the ratchet belt buckle, where a locking mechanism holds the belt in place on our unique tracking system and auto locks it from the back. To remove the belt, simply press the small metal lever on the bottom of the buckle and get a smooth inaudible release in a second! 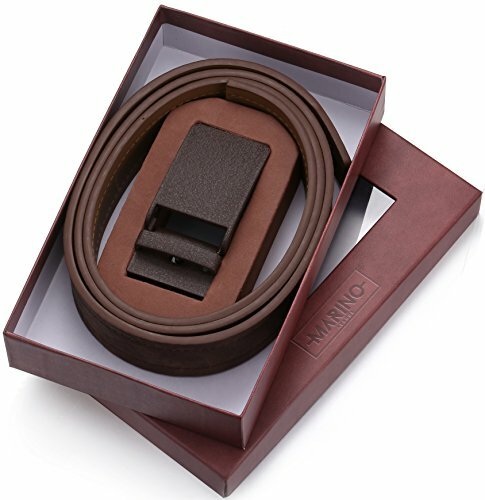 The Marino Casual Jean Ratchet Belt pairs perfectly with your favorite jeans while maintaining a stylish and fashionable look. The cool and nifty leather buckle is suitable for everyday wear as well as for those special nights out. 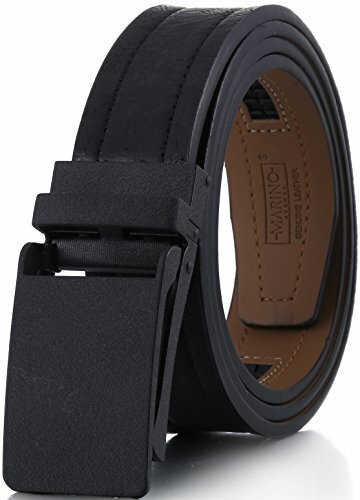 Marino offers an adjustable trim to fit option with measurement marks on reverse side of belt for the perfect fit. 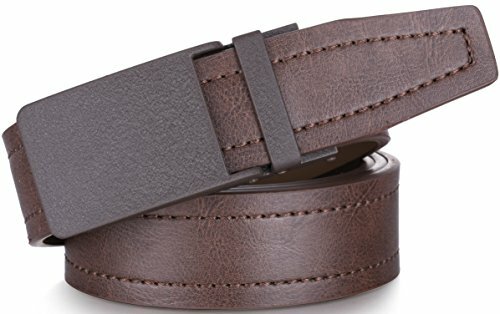 Simply cut the belt to your desired size and secure it firmly with latch closure. We strive toward our mission for ultimate customer satisfaction. The Marino passion is to provide our customers with a most pleasant experience. Our 45 days return policy, with an addition of 180 days warranty, enables you to purchase risk free! LINXX BUCKLE - Is the new INNOVATIVE EFFORTLESS SOLUTION. Just lift the buckle to obtain an inaudible release! Extremely easy to use! Slide belt in to tighten and the belt auto locks - simple smooth and sleek. GENUINE LEATHER - Provides the perfect accent to jeans with maximum durability while retaining a casual and highly fashionable look. 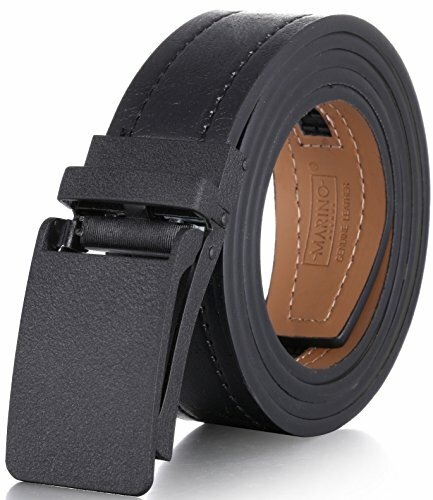 1.3/8 inches in width keeps your jeans sturdy and in place with a nifty leather buckle designed with class. 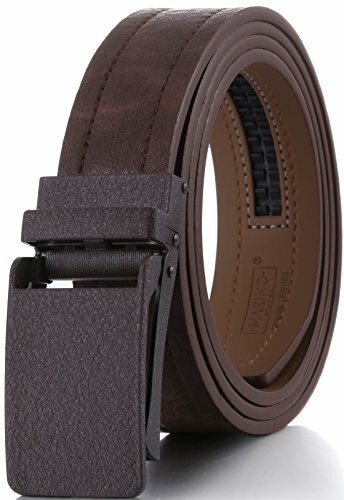 ADJUSTABLE FIT - Up to 44" or 54" in waist, this belt comes with a trim to fit option and adjustable marks for exact measurement. EASY USE Just slide the belt into the buckle and pull the belt through. The buckle simply auto locks the belt. To release the belt, gently push the lever on the side of the buckle and the lock will snap. GIFT BOX - Enclosed in a sleek and modern gift box for the Ideal gift giving experience. ORDER WITH GRACE - 100% satisfaction guaranteed, 45 days free exchange and returns, plus 180 days warranty. Our mission is to have our customers extremely gratified with the belt they purchased, so if you haven't so, please take advantage of our swift exchange and return policy.